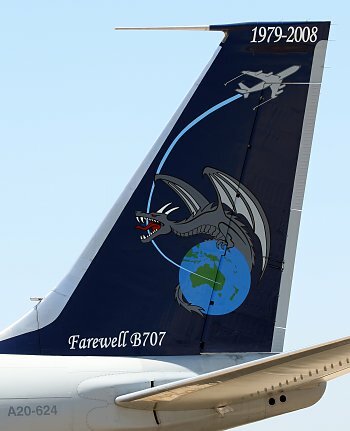 Commemorative artwork on the tail of A20-624. For reasons of completeness, Australian 707 operators other than Qantas have been recorded on this website. 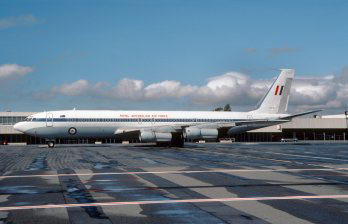 This page describes the Boeing 707 fleet operated by the RAAF. 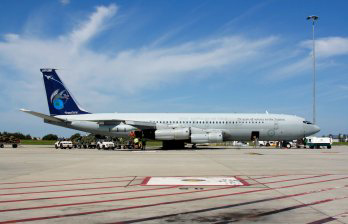 To mark the retirement of the 707 from RAAF service on 30 June 2008, 33 Sqn held a ceremony at RAAF Richmond. A brochure produced for the ceremony can be viewed here. Delivered to Saudia as HZ-ACG. Sold to Boeing as N1987B. Delivered to Saudia as HZ-ACI. Sold to Boeing as N7486B. Flown from RAAF Richmond to RAAF Amberley. Test flown at Amberley as N707QJ and departed later same day for Darwin, Male, Cairo and Manston. The engines were removed from the aircraft at Manston. Reportedly being parted out by Omega Air. Noted at Manston with tail and other parts removed. Reported that seats were donated to the Airport Fire Service for fitment to a 747 airframe for training purposes. Noted with engine pylons and wing control surfaces missing. In early May 2012 the aircraft was broken up for scrap at Manston, reportedly inside a hangar. There are reports that part of the fuselage was saved for an un-named museum. on this date the last load of scrap departed Manston Airport. The basic airframe on its undercarriage with rear fuselage and outer wings cut off was photographed at Manston. Withdrawn from service and all four engines removed. Noted at Richmond with four engines fitted and running. Reportedly sold to Omega Air. Registered to Omega Air as N623RH. Departed Richmond on delivery to Omega Air. As of this date the aircraft is stored for possible future fleet expansion. 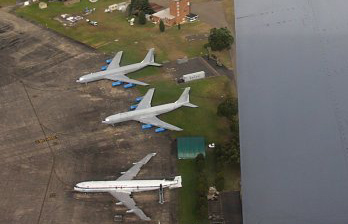 Towed from 33SQN hangar and parked with the other retired 707s. Registered to Omega Air as N624RH. WFS at Richmond and used for parts. The aircraft was dismantled at Richmond. The forward fuselage will go to the RAAF Museum at Point Cook and the fin and rudder will go to the Qantas Founders Museum at Longreach. The forward fuselage will now be going to HARS at Albion Park. The forward fuselage was delivered to HARS at Albion Park. Registered to Omega Air as N629RH. Delivered to Saudia as HZ-ACC. Sold to Boeing as N1486B. 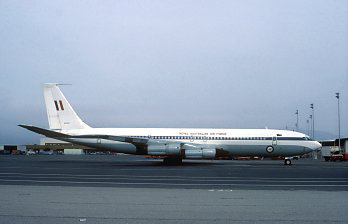 Never entered service with the RAAF although the Saudia livery was replaced by RAAF markings to make the aircraft less conspicuous. Used for parts and as a trainaid. Request for Tender No. 94/20021 with a closing date of 20APR94 called for the sale of "Unserviceable Boeing B707 Aircraft Hulk (incomplete) Boeing Serial No. 19809" located at RAAF Base Richmond. The aircraft was subsequently broken up for scrap at Richmond. The aircraft was identified as A20-809 in some RAAF documentation but this serial was not painted on the airframe. HZ-ACC in Saudi Arabian Airlines livery in 1969. This aircraft was acquired by the RAAF for parts but never entered service. 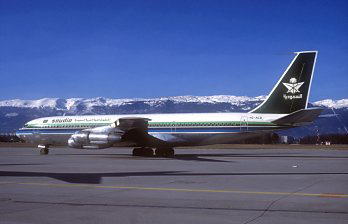 HZ-ACC in Saudia livery at Geneva in August 1973. This aircraft was acquired by the RAAF for parts but never entered service. HZ-ACC in partial RAAF livery at Richmond in March 1991. Acquired as a source of parts, the aircraft carries the name Hulksbury. The ill-fated A20-103 photographed in 1991. 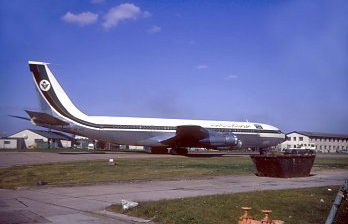 A20-261 in service with Saudia as HZ-ACI. A20-261 photographed in June 1998. A20-261 photographed in February 2005. A20-261 photographed in March 2005. A20-624 photographed in February 2008. When it was decided that the RAAF would acquire 707s from Qantas, several RAAF aircrew were trained on the aeroplane by Qantas. In all, six pilots and three flight engineers were trained by Qantas with all subsequent training being done in-house by the RAAF. 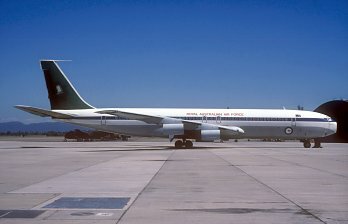 The initial batch of trainees used the Qantas 707 simulator at Mascot but this was sold to Aer Lingus in Ireland immediately after they completed their training. Subsequent 707 crew used the Cathay Pacific simulator at Kai Tak in Hong Kong. Eventually the original Qantas simulator came back from Ireland and was installed at the Qantas Jet Base at Mascot. This was used until the RAAF acquired a more modern simulator which was installed at RAAF Richmond. The initial RAAF 707 crew are listed below with their Qantas trainers. 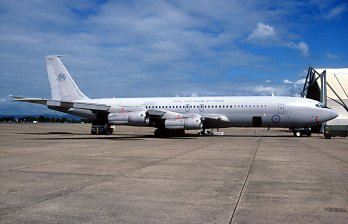 Omega Air approached the Defence Department to acquire one B707 but Defence decided to retain the aircraft for spares. (A20-627 had been used as a spares source since February 2001). 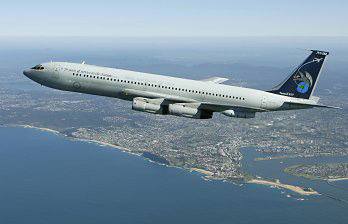 Defence decided to withdraw the B707 from service on 01JUL08. Defence transferred the sole B707 that had not been converted to a tanker to a commercial company in exchange for B707 spare parts. This was A20-261 which was acquired without engines by Turbine Motor Works in the UK. It is understood that the "spare parts" consisted mainly of JT3 engine overhaul, an activity in which TMW specialised. Omega Air wrote to Defence expressing interest in acquiring the remaining B707s subject to an inspection in July 2007. Omega Air made an unsolicited offer to Defence to purchase three B707s, spares, flight simulator and documentation for $10.5M. 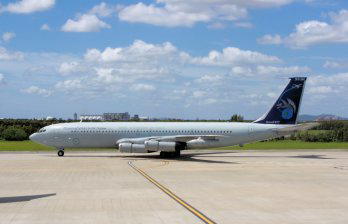 The final RAAF Boeing 707 flight was operated by A20-624. Before a contract had been signed, Omega wrote to Defence to advise that it was experiencing financial difficulties. Omega proposed a reduction in purchase price in return for an offer of flight refuelling services to the value of $6.2M. After consideration, Defence declined this offer. Omega Air requested that the delivery date for the the three aircraft and the simulator be deferred until 30SEP09. Defence signed the contract deferring the delivery date until 30SEP09. Omega Air signed the contract deferring the delivery date until 30SEP09. Omega Air requested a further three-month extension because it had been unable to obtain Federal Aviation Administration approvals. Defence rejected Omega Air's request for an extension. Defence offered Omega Air an extension until 29JAN10 provided it paid an additional security deposit of $1M. Omega Air rejected the offer. Defence terminated the Omega Air contract with a view to seeking damages for the company’s breaches of the contract. At this point Omega Air had paid Defence a total of $2.8M and taken possession of the B707 aircraft spares and documentation. 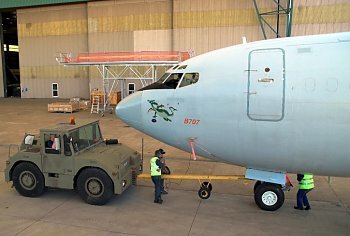 Defence issued a new request-for-tender (RFT) for the re-sale of the remaining B707 assets, which closed on 10NOV10. The remaining B707 assets comprised three B707 aircraft, one B707 flight simulator and one incomplete B707 airframe (A20-627). It received four responses with offers ranging from a best offer of $90K to a net cost to Defence of $900K. That the offers were so low is no doubt attributable to the fact that the aircraft documentation, spares and training material had already been sold and handed over to Omega Air in early 2009 upon payment of the instalment of $1.8M. The dispute between Defence and Omega Air was settled. Under the settlement, the purchase price was reduced to between $6.2M and $9.2M. Omega Air’s payment of the $3M difference was conditional upon it obtaining certain US Federal Aviation Administration (FAA) certifications for the three B707 aircraft before 31DEC14. The terms of the January 2011 settlement allowed Omega Air to take possession of the B707 aircraft and flight simulator without paying the Commonwealth in full for the assets. On 03FEB11, Omega Air paid Defence the $1.4M required for the settlement to take effect and for title to the three aircraft and the simulator to pass to Omega Air. N624RH (ex A20-624) departed RAAF Richmond with an Omega Air crew. N629RH (ex A20-629) departed RAAF Richmond with an Omega Air crew. N623RH (ex A20-623) departed RAAF Richmond with an Omega Air crew. Omega Air took possession of the simulator. 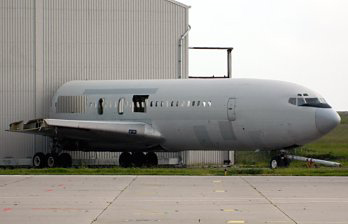 Omega Air had by this stage paid a total of $4.2M for the B707 assets including the $1.8M paid for the spares, training material and documentation in 2009. The full contract price was $9.5M including the $3M contingent on Omega Air obtaining FAA certifications. These amounts are exclusive of GST. Omega Air requested that the due date for the next payment of $1M (which had been due in JAN13) be deferred one year until 01FEB14 and then be payable in instalments of $250K a month from 01FEB14 to 01MAY14. 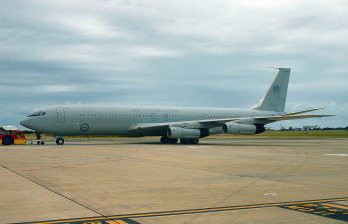 By this date Defence had paid Omega Air $24.04M for aerial refuelling services (not including the cost of the fuel). 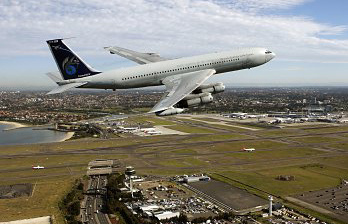 At times these services were provided using an ex-RAAF B707 which had not been paid for! However, these costs were offset by damages received as a result of the delayed entry into service of the Airbus A330MRTT (KC-30B). Defence rejected Omega Air’s request that payments be deferred one year until 01FEB14. Negotiations continued between Defence and Omega Air in the months that followed. Defence continued to insist on payment in full. Defence advised Omega Air that an embargo that Defence had placed on its use of refuelling services from the Omega Group would continue until Omega Air met its obligations in full. Omega Air began paying in instalments the remaining $2.62M owed to the Commonwealth. 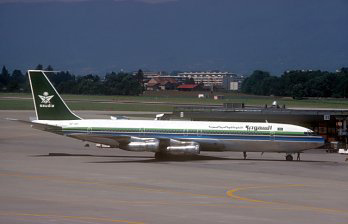 It emerged that Omega Air could continue to operate the B707 without FAA certification and Defence formed the view that they were therefore unlikely to seek certification. Accordingly, Defence did not receive the remaining $3M of the original contract price because FAA certification was not achieved by 31DEC14. By this date Omega Air had paid the total reduced purchase price of $6.2M. Reformatted the table of RAAF 707s and refreshed the page generally. 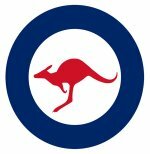 Added a table of the initial RAAF aircrew who were trained by Qantas. Thanks to Tony Ryan and Norman King for supplying this information. Added the above table titled "The Disposal Saga". Added an image of the ill-fated A20-103 while in service with Saudia as HZ-ACG.. The former A20-261 still clings to life at Manston (see image above). Also added an image of N707QJ at Amberley. The former A20-261 has been broken up at Manston. Added an image of the "Hulksbury", the former HZ-ACC. Added details of the tender for the sale of msn 19809 formerly HZ-ACC. Added a gallery of images of the final departures from Richmond. Added details of the departure from Richmond of N624RH, N629RH and N623RH. Added disposal details of the 3 remaining RAAF aircraft and the forward fuselage of A20-627. Also added details of the parting-out of the former A20-261..
Added two images of HZ-ACC in different Saudi liveries. 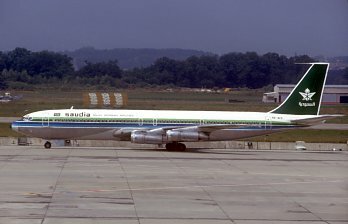 Added an image of A20-261 in service with Saudia as HZ-ACI. Updated the entry for A20-627. Added images of A20-103 and A20-261. Added further information on the "Hulksbury". A combined RAAF/Ansett page was split into two separate pages. The above table has been updated with information drawn from a commemorative folder produced by 33 Sqn to mark the retirement of the 707. Earlier reports that A20-623 was originally named "City of Sydney" in RAAF service would appear to be incorrect. Accordingly this reference has been deleted. Added further information on A20-623. Added further information on the departure of the former A20-261. A20-623 has been withdrawn from service and A20-261 has been sold to Turbine Motor Works of the U.K.
Added dates that A20-261 and A20-627 were withdrawn from service. Thanks to Bob Coppinger.